My sister recently told me that her lettuce wasn’t doing very well because she hadn’t had time to water it. I told her that shouldn’t matter, and she argued with me, telling me that lettuce needs lots of water. I like to test these “rules” in my own garden, which often makes for some interesting arrangements and results. On May 5th I bought a mix of lettuce and planted it. I watered it on the day of planting and once after. 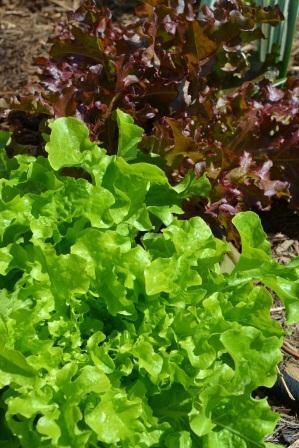 As you probably recall, we had very little rain in Southern Ontario in the month of May, so my watering was the most the lettuce got. I was pleasantly surprised how much my lettuce grew in that time. 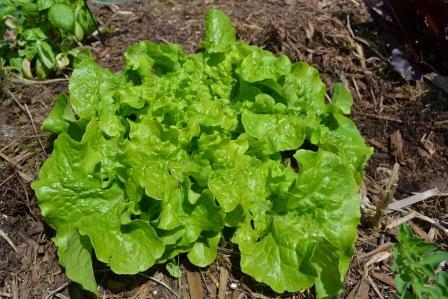 I had my first salad from my garden this past Monday, and it’s still growing strong, ready for another harvest today. (I know we had a fair amount of rain this past weekend, but I my lettuce was growing very well before that). My low water lettuce, with one harvest already done. A little about the conditions of my garden; I have a raised garden/retaining wall, which is south facing and has a sandy loam soil mix (thanks to the previous owner). The retaining wall is crumbling, adding to the “well-drained” conditions of the raised garden. I have wood mulch throughout, and lots of it (the other day I was planting some Kale and realized there was over 6 inches of mulch in once area of the garden). 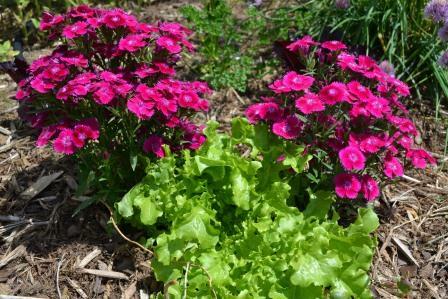 Using lettuce to create foliage interest in your garden. For the first time ever, my other half actually commented on how great the garden looked, and how beautiful the colours looked (he prefers grass to EVERYTHING). Am I telling you to push your plants into a perpetual state of thirst? Not at all. But stop over-pampering your plants, they are living things and they will adapt to the conditions to survive. They have root systems which will quickly grow or move to find moisture, and at the same time, they will shrink and limit growth if there is too much water. Play with the “rules” of gardening a bit and see what great results you may end up with. Less water will typically amount in better results than too much.